W elcome to T-SQL training course. 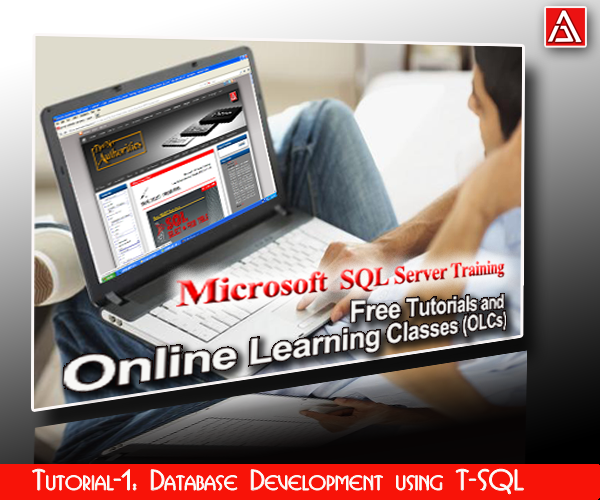 Finally you got right place to learn T-Sql in easy, efficient, task-oriented and well-organized manner. The training process categorized into THREE(3)-Effective tutotrials and each one delievers a task- oriented valuable material organized into Online-Learning Classes (OLCs). Each OLC has its scope and vision. However, first tutorial classes, provides you with maximum stuff and satisfaction to learn and implement Sql Query. The Tutorial-2 taught you how you can do Db-Programming using T-SQL; this includes writing Stored Procedures, Functions (UDF), Triggers, Cursors and Transaction using T-SQL constructs; The final Tutorial-3, explains how can you do database modeling using E-R diagrams and following predefined RDBMS rules. Class-1 Local & Global Temporary Tables"
Class-1: Overview of INDEXes and their optimizations types etc. Class-2: HowDoI CREATION,ALTER, DELETION and OPTIMIZATION etc"
I hope you would like and enjoy reading all OLCs (Online Learning Classes) that I have try to explain the concept precisely. I will do my best to write and update the posts as well on time to ensure you people get all stuff at single place. The approach I follow here will help you to quickly locate the appropriate token, associated sections with bunch of examples to ensure your completeness. I thing, you will find this would be substitutable to reading books or class-room teaching approaches. I hope so, happy learning. The targeted audience could be beginners to help them understand the basic of Transact-Sql. The targeted audience could be intermediate-level & expertise professional to take reference while implementing database objects. That's a great article. Thanks for sharing your knowledge with us..
Greetings! Very helpful advice within this article! Excellent write-up. I absolutely appreciate this website. Continue the good work!